Our strength: Our large number of diverse users. Our challenge: Our large number of diverse users. Naviance is a workspace that helps many educators get their job done efficiently. We have users who have used our system since its inception and are extremely familiar with its processes and others who are learning something new every day. At Hobsons, we are constantly seeking to make it even better so that all users, whether public or private, tech-savvy or novice, student, educator or parent, can use it with ease and efficiency. For a typical project, we work with a diverse team of researchers, designers, managers, and engineers, to come up with various design ideas. We then take those ideas to our research participants and see what their thoughts are, and their thoughts are everything. "NO, THAT WOULDN’T WORK FOR ME." "I NEVER WOULD HAVE THOUGHT OF THAT, BUT THAT MAKES SENSE." "THAT'S OKAY, BUT I WOULD PREFER IF IT DID THIS INSTEAD." Reactions like these are music to our ears, because it helps us validate assumptions as well as take us off the wrong path. Why is User Participation So Important? While we do intense background research as we develop solutions, we are not the end user and don't always understand the real-world constraints involved with using our platform. For instance, as we were talking to users when we were integrating the new student assessment, Gallup StrengthsExplorer®, into our product, we realized that it was difficult for our counselors to stay on top of students' results because assessment results were mixed in with school surveys and students graduation plans. User research revealed that there was not only a need for a separate 'assessments' tab for counselors to quickly find students' results, but also a need to show dates of completion, a snapshot of results, and quick way to download the complete report. While testing solutions for our soon-to-be-launched college and career readiness curriculum, our initial set of designs for students' goal prioritization had them assigning deadlines to goals. However, discussions with student participants revealed that they tended to order assignments by priority and didn't necessarily think in terms of dates like the rest of us were accustomed to. We incorporated these findings in our next iteration and the first response was, "Oh yeah, this is cool!" Win! Another example that indicates the importance of user research was the new look for the Naviance homepage. Our first iteration had popular tools housed differently, using one icon. From a design standpoint, it cleared up some real estate and followed more typical standard patterns. However, our user research revealed that it wasn't completely intuitive for all our users. Our next iteration incorporated some of the suggestions and broke the tools into two different icons. We then heard things like, "The question mark makes sense!" and "That's much easier for me to understand immediately." Sign up here! Based on the project, we'll send you an email inviting you to participate. Again, depending on the project, you'll be requested to either answer a survey, watch a video, interact with a prototype or sign up to speak to one of our researchers. We strive to speak to a representative sample of our users and all feedback is important. If you simply don't have the time to participate, that's okay too. Send us user experience feedback whenever you can to uxr@hobsons.com or simply follow Shreya on Twitter. Let your voice be heard! 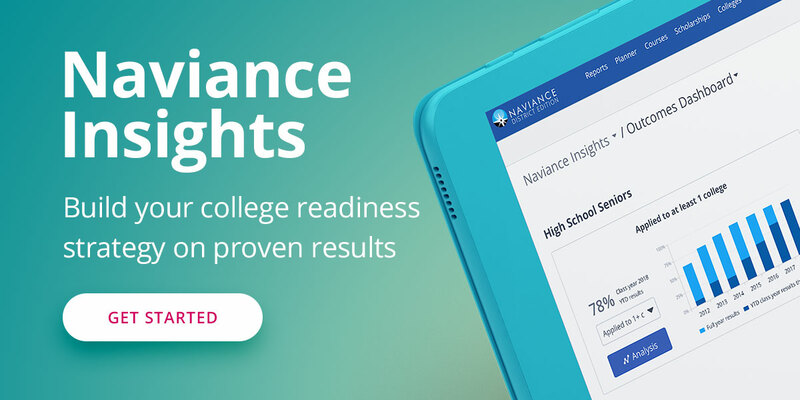 It's your Naviance, after all.